The maximum working temperature of this USB C hub can reach to 108.8 F(42.7 C), which may feel warm to the touch, but should not result in burns with brief contact. 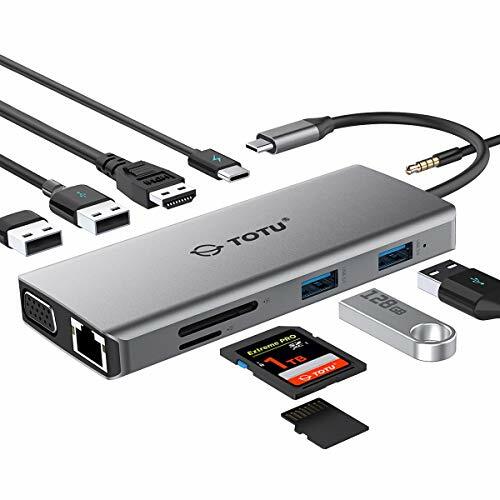 Extensive Capability TOTU 11-in-1 USB Type C Hub includes Ethernet/RJ-45 port, Type C PD Charging Port, 2 USB 3.0 ports, 2 USB 2.0 ports, 4K HDMI video output. VGA, Micro SD & TF card reader. The SD card slot and the TF card slot can be used on the hub simultaneous.Mic/Audio port in extremely compact and sleek design.What you can get: 11-1 USB C hub, 1 user manual, 1 travel pouch, 1-year and friendly customer service. Please feel free to contact us at any time. Incredible Compatibility: Compatible with cell phone (DP Alt Mode): Samsung Galaxy Note S8/plus, S9/plus, LG G5/V20 and Huawei high-end series. Also compatible with the latest laptops and smart devices with USB C port :Mac book 12/ Pro, Mate Book X, MI Air 12.5/13.3, iPad Pro 2018(PD Charging and HDMI only), Google Chromebook 2016 etc. HP charging and incompatible problems may be due to HP as they do not allow 3rd party charger to charge their laptop. HP devices must use the original charger. Not fit to MacBook Air/Pro with Case/Cover. Ultra Slim Type C Hub Specifically Designed for 2018/2019 MacBook Air, 2019/2018-2016 MacBook Pro - including 13" and 15"
Strong Power Delivery - Support up to 100W power delivery to charge both 13 (61W) and 15 (87W) MacBook Pro at full speed while having all data ports in use and delivering up to 1.5A of power per USB 3.1 port. 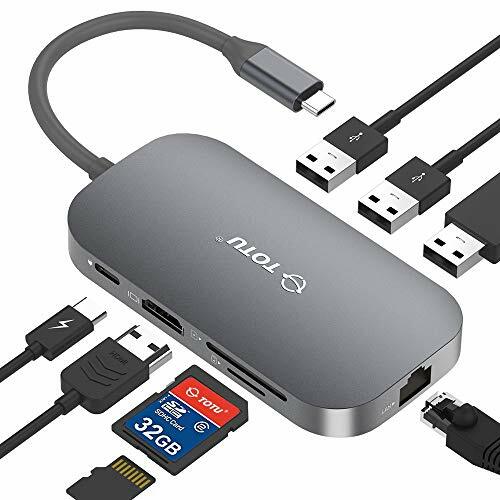 get 2 USB-A data ports, 1 USB-C power Delivery charging port, 1 USB-C data port, 1 HDMI port 1 Micro SD card slot, and 1 standard SD slot all in one hub. sync a complete music library or an entire vacation's photo album nearly instantaneously with 5 Gbps data transfer. swap and sync data from almost any SD card, with a standard and micro SD port each capable of handling a wide range of formats. 2.4 GHz wireless devices, MIDI devices, and some USB 3.0 devices may not be supported. The extended cable is 0.6 ft long. Transmit data via USB at up to 5Gbps, fast enough to transfer a high-definition movie in seconds no more wait times when sending and receiving important files. With an extended 2 ft cable, organizing your workspace just the way you like has gotten much easier. 2.4 GHz wireless devices (such as wireless keyboards and mice), MIDI devices and some USB 3.0 devices may not be supported, or may not work in close proximity to a hub or other USB 3.0 device. For a stable connection, avoid connecting high power-consumption devices, such as external hard drives. The hub will sync but not charge tablets (such as an iPad) and other devices that require a higher power input. Connected devices must not exceed a total of 5V / 900 mAh. What You Get: Anker Ultra Slim 4-Port USB 3.0 Data Hub, welcome guide, our worry-free 18-month warranty, and friendly customer service. Sync and connect through more ports at speed. Don't deny your devices access to SuperSpeed ports. With transfer rates of up to 5Gbps, set aside less time for syncing and more time for work. And thanks to 3 extra data terminals, you no longer have to constantly switch and unplug everything. What good is such versatility if you can't take it out? With no screws and a stylish, mirrored front, the slim and compact Anker 3-Port Hub expands your capability, wherever you are. To ensure a stable connection, don't use this hub with high power-consumption devices such as some large-capacity hard drives. Windows (32/64 bit) 10 / 8.1 / 8 / 7 / Vista / XP, Mac OS X 10.6 to 10.9, Linux 2.6.14 or above. On Windows, a driver needs to be manually installed to enable ethernet connection. No drivers required for data ports on all compatible systems. Easily add 3 USB 3.0 SuperSpeed ports to your PC and enjoy data transfer rates of up to 5Gbps for faster sync times. Lightweight power-bar design effectively saves space. Green LED indicates normal operation. Built-in surge protection keeps your devices and data safe and supports hot swapping. 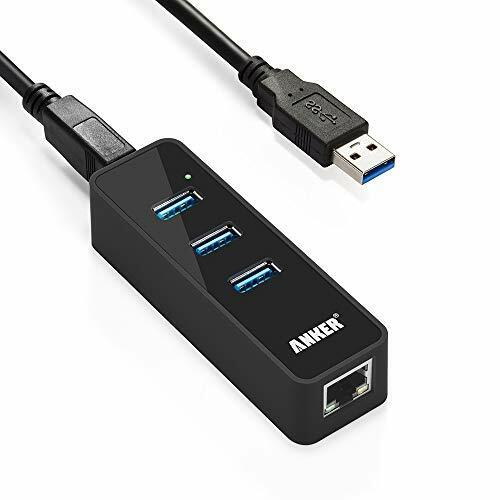 Package contents: Anker 3-Port USB and Ethernet Hub, 1.6ft / 50cm USB 3.0 cable, welcome guide, 18-month hassle-free warranty. 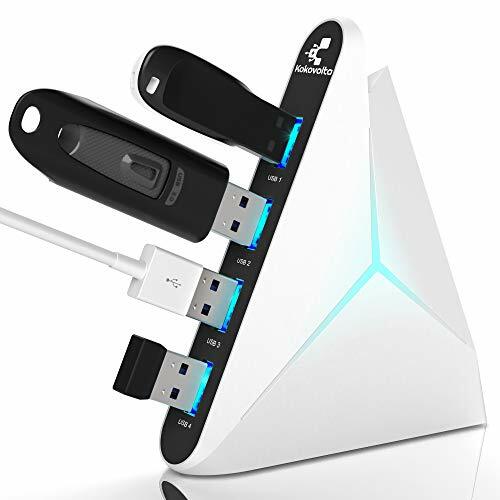 All in One Station Six in one get 3 standard USB 3.0 ports, 1 HDMI multimedia port, 1 PD 3.0 USB C charging port and 1 Ethernet port for Internet connectivity in one hub. Advanced Technology Use the same heat dissipation technology as MacBook Pro to extend the working life and provide a excellent performance. Buit in advanced dual-core VL817 chip with lower power consumption, quicker heat dissipation and higher data transfer efficiency than others. Safer and Durable Using exclusive multi-protection systems ensure over-current protection, over-voltage protection, short circuit Protection and high-temperature protection. 60W USB C Power Delivery Support PD 3.0/2.0 fast charge for laptop, simultaneously using video or USB devices. RJ45 1000M Ethernet port RJ45 LAN Port can support more stable Internet connection in speed up to maximum 1000M. 3 USB 3.0 ports Data transmission at a speed up to 5Gbps. 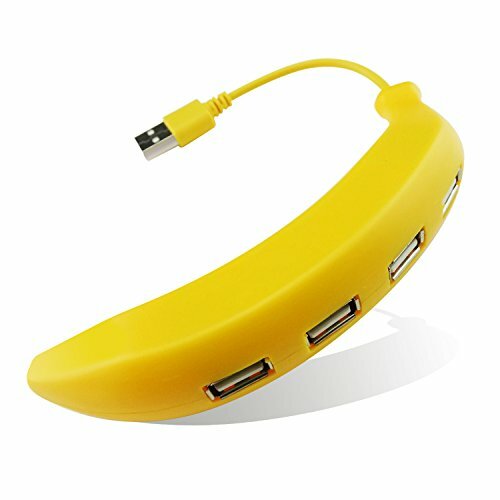 Support USB flash drive, external hard drive, keyboard, mouse, printer, MP3 player etc. Vivid Video, Speedy Sync HDMI Port Support a large screen liquid crystal TV or display compatible with 4K Max output. Give you vivi 3D effect video sync. Worry-free Warranty At UtechSmart, we try our best to serve each customers. We offer a 18-month warranty by refund or replacement. Any questions, feel free to let us know. We will respond to you very quickly. Please note 1.For a stable connection, connected devices should not exceed a combined current of 900mA. Not intended for use with high-power devices (external hard drives, iPads, etc.). 2.2.4 GHz wireless devices, MIDI devices and some USB 3.0 devices may not be supported. 3.The USB Type-C PD Charging port of this product is only for charging USB-C laptops whose USB-C port supports USB Power Delivery (PD). The USB Type-C PD Charging port of this product does not support data transfer. 4. Power is shared between all dock-connected USB C devices. If you would like to enjoy the fast charge, please choose over 72W Adapter to charge it. 5. 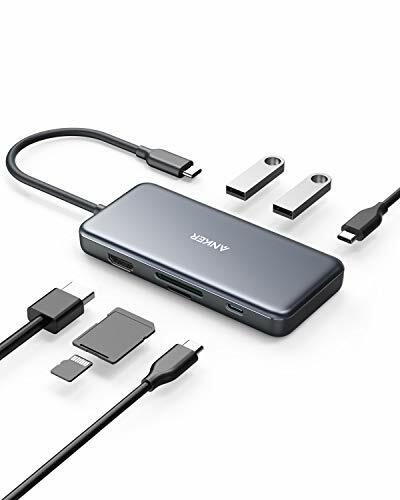 Our USB C Hub don't support Nintendo Switch to get the LAN wired connection work for the chip compatibility. We are working on this issue. 6. The USB ports don't support data transfer With the iPad Pro for the chip compatibility. UtechSmart Dual-Core Technology Offer 1 Year Warranty Offer 1 year refund/replacement warranty and friendly customer service. Built in advanced dual-core VL817 chip with lower power consumption, quicker heat dissipation and higher data transfer efficiency. Temperature Control Use the same heat dissipation technology as MacBook Pro to extend the working life and provide a excellent performance. Make it safe and reliable when 6 ports are occupied. 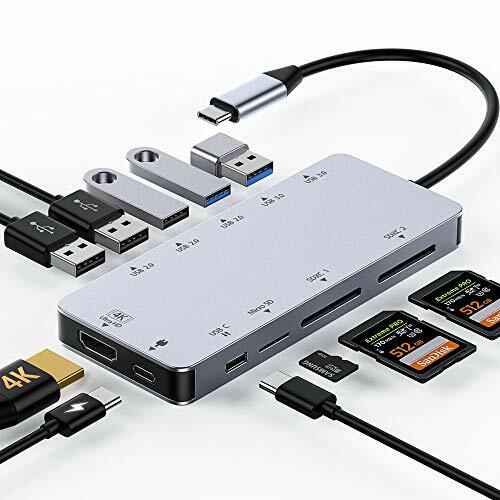 All-in-one USB C Hub Connect to the latest MacBook Pro or USB-C devices with the 6-in-1 USB-C hub featuring an Ethernet port, a USB C charging port with power delivery, a 4K HDMI port, and 3 USB 3.0 Ports. Data transmission at a speed up to 5Gbps. 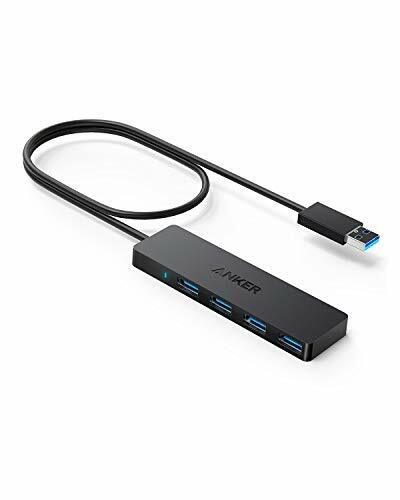 Power Delivery USB Type C Hub charges your MacBook Pro or other Type-C devices while connecting 60W power delivery port. Now more and more devices and the newest Mac Pro support PD. 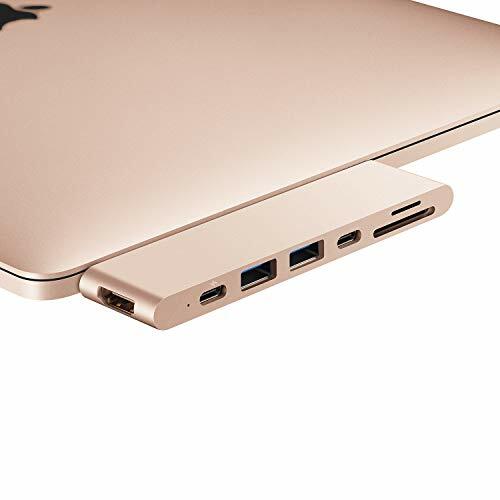 With power delivery, a single USB-C port can give you Blazing-fast charging speed experience. Perfectly match the Mac Pro. RJ45 1000M Ethernet Port & 4K HDMI Video Supports 1000Mbps Gigabit RJ45 Ethernet port, backwards compatible with 100Mbps/10Mbps RJ45 LAN. HDMI port support a large screen liquid crystal TV or display compatible with 4K Max output. Give you vivi 3D effect video Sync. Stylish Design, Premium Build Thin and Sleek precision milled aircraft grade aluminum enclosure makes it a perfect complement for your Pro look and feel in New space Gray. Board Compatibility An ideal USB-C expansion hub for Apple MacBook, Apple MacBook Pro 2016/2017/2018, Apple iMac/ iMac Pro (21.5 inch, 27 inch), Google Chromebook Pixel, Samsung, Dell, Asus, HP, Lenovo, XPS and many other Type C laptops. 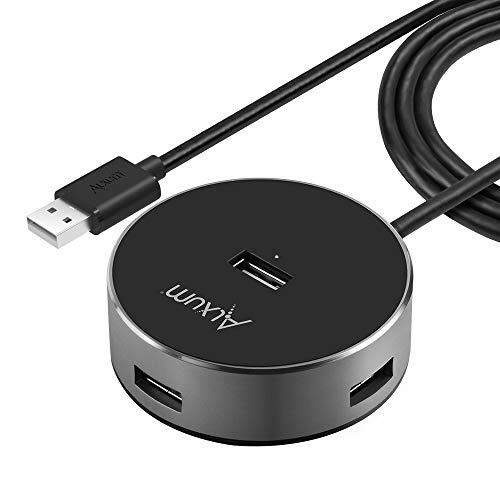 Alxum Hi-Speed USB 2.0 4-Port Ultra Mini Hub, add up to 4 peripherals quickly and easily for Plug-and-Play connectivity to your USB 1.1 and USB 2.0 devices. Eespecially great for notebooks which come with only a few ports in an era when you need to attach many USB devices at once, such as a mouse, keyboard, card reader or thumb drive, ect. It offers an ideal way to connect on the road, and virtually anywhere you need fast access to your USB devices. 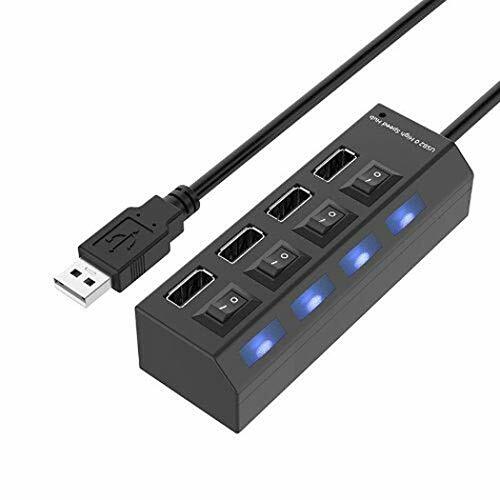 With compact size, this 4 port USB 2.0 hub is a perfect lightweight travel tool, and the right companion for your business trip and travel. This compact hub tucks easily into the pocket of your laptop bag. Only take it out when you need to connect additional USB peripherals, like mouse, keyboard, thumb drive, digital cameras, flash drives, iPod ect. Charge Your Device And Transfer Data At The Same Time Thanks Unique USB Hub from Kokovolta! Keeping you satisfied is our number one goal. This is why we offer you a 100% money back guarantee. Do Not Waste Time And Place Your Order Now While Supplies Still Available! [4K Video Adapter] Mirror or extend your screen with HDMI port and directly stream 4K UHD (3840x2160@30Hz) or Full HD (1920 x 1080@ 60 Hz) video to HDTV, monitors,TV and projectors. [SUPERSPEED DATA SYNCING] 3*USB 3.0 ports allow data transfer rate of up to 5 Gbps, fast enough to transfer an HD movie in seconds. Built in SD and TF slots easily transfers files from SD/TF card to your devices at a speedy 5 Gbps. [Our Worry-Free Warranty] USB C HUB adapter is backed with 12-Month product replacement Warranty and friendly customer service. 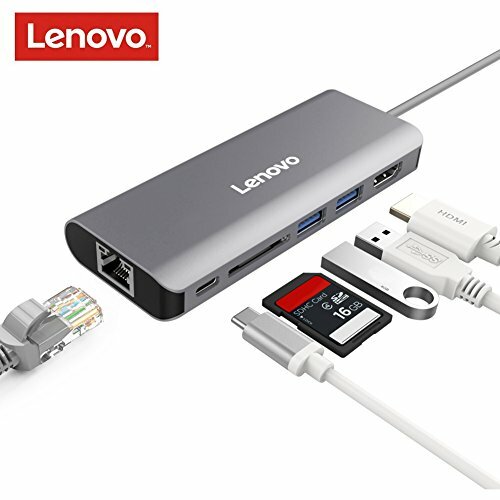 This 6-in-1 Lenovo USB-C hub expands the limited connectivity of your laptop with an HDMI output port, a Gigabit Ethernet port (RJ-45 port), a USB-C charging port, 2 USB 3.0 ports, and a SD card reader. 3.For stable connection, connect a power adapter to the hub when using high-power devices. The hub can only support One hard driver when no power source is connected to the hub. 5.A capable display and a capable HDMI cable are required to achieve 3840x2160 resolution. mouse: 100mA> portable hard disk: Max. 500mA> USB 3.0 portable hard disk: Max. 900mA> keyboard: Max. 500mA> please double check the current of your devices before connecting to the hub. Inovi 7-IN-2 Slim Hub is the best option for connecting older peripherals to your new MacBook Pro 2016-2019 and MacBook Air 2018-2019. Complement your USB-C MacBook with this HUB s sleek, modern design that is a neat combination of aesthetics and function. 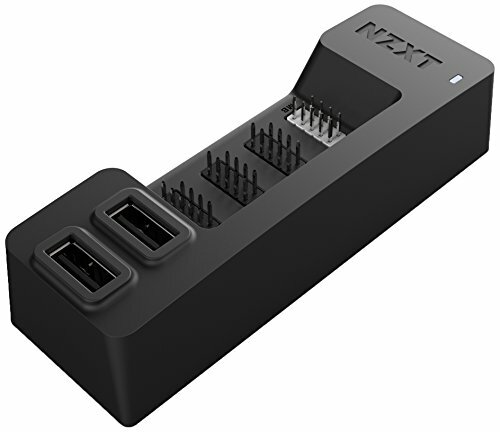 With two USB 3.0 ports plus HDMI (with 4K support), Ethernet, SD, microSD, and power passthrough, the Inovi HUB offers the connectors you need most of the time. It s powerful enough to leave at your desk full-time as a docking station but small enough to slip in your laptop bag and use on the go. Hot swapping is supported, so you can insert and remove this hub while your device is running. *The working temperature of the hub is about 40 /104 F, which may feel a bit warm to the touch. *This hub is not case compatible. Please use it without a case on your MacBook to allow perfect connectivity. EXPAND YOUR MAC's COMPATIBILITY - The iNovi Slim 7 in 2 HUB slots into the 2 USB-C ports of your new 13"/15" MacBook Pro or 2018 MacBook Air expanding them to an 4k HDMI port, 2 x USB 3.0 5Gbit/s, Gigabit Ethernet, USB-C w/ full-speed Power Delivery, SD and microSD card readers. CRISP RESOLUTION - Reach to a max resolution of 1080@60Hz or HDMI 4K@(3840x2160P)30Hz. You can either mirror or extend your screen without worry about blur, distortion or delays. Perfect for all your projects, presentations, movie nights and more! EVOLVED TECHNOLOGY - With data transfer rates up to 5Gbps you can upload and download photos, videos, and other files quickly. Does not require any drivers, or complicated installation process. The UPGRADED iNovi Hub has stable output, temperature protection, anti-over current, and anti-short circuit. RELIABLE ETHERNET CONNECTION - The Ethernet port can handle Gigabit speeds of 10/100/1000Mbps. Quickly add a wired network port to your USB-C laptop for fast, stable Ethernet connection. MAC -STYLE DESIGN - With a streamlined rectangular shape, the hub is accenting the side of your laptop without adding additional cluttering wires. Available in the same colour scheme & appearance as MacBook Air & MacBook Pro, the compact and easy-to-use design makes it portable and easy-to-use, so take it anywhere you go - perfect for home use, office, business and travel. This hub is not case compatible! Please use it without a case on your MacBook to allow perfect connectivity. 1*4K HDMI and Samsung Dex Station: USB C hub connect your macbook or other type c devices and connect an HDMI cable from your usb c adapter's HDMI port to your external monitor.With this adapter, you can extend video to your monitor/projector/TV with the 4K HDMI port from your Laptop or computer. 2*USB C ports: PD fast charging and superspeed data transmission. 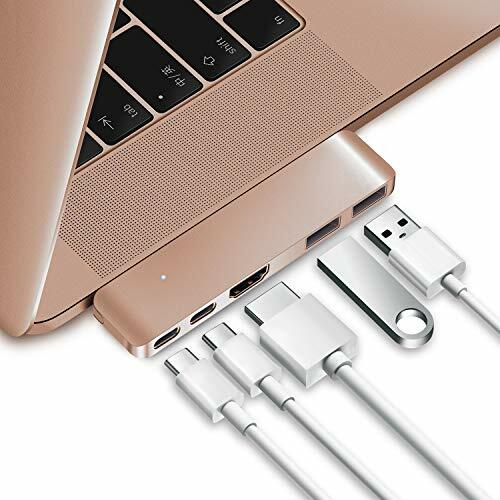 When you connect to the Type-c port for data transfer, you can also use the PD port (Thunderbolt 3) to charge your macbook, mobile phones.Even charging other small devices such as power bank, small fans, desk lamps, etc. 3*USB 3.0 ports: Superspeed data transfer of up to 5Gbps,backwards compatible to USB 2.0.1.1 and 1.0. 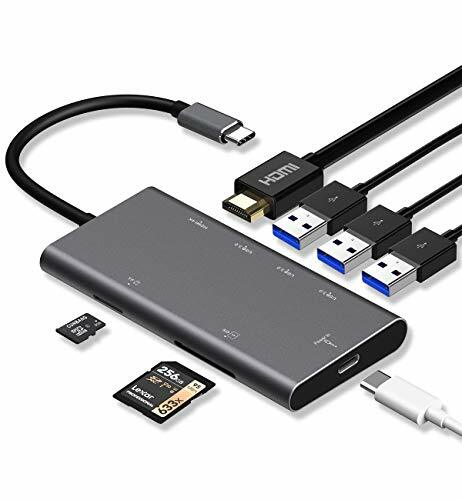 And you can use 3 supper fast speed usb 3.0 ports to connect your keyboard, mouse, hard drive for your new usb c latops. Type C Cable Length: 4.56in. *** For best performance, devices connected to this hub should not exceed total current of 900mA maximum when no power source is connected to the hub. Otherwise, output current may become unstable or disconnected. 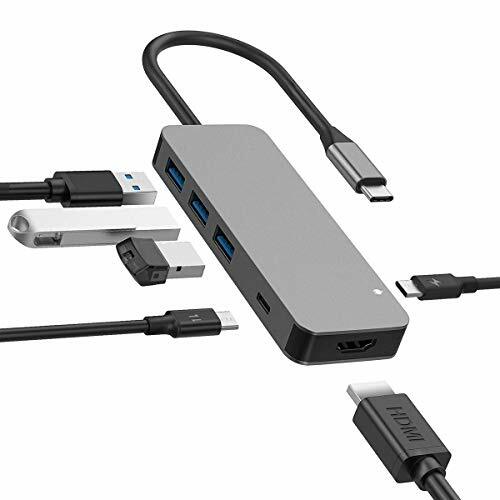 6 in 1 USB C Adapter The plug-and-play USB C hub turns one USB C port into 6 ports, include 1*4K HDMI, 3*USB 3.0, 2 USB-C (power delivery/data transmission). which allows your MacBook or other type c devices to connect with more peripherals simultaneously. 4K HDMI & Samsung Dex Mode USB to hdmi adapter enables you to extend the display of your laptop to your TV, monitor or projector in up to 4K UHD (3840x2160@30Hz) resolution.Support Samsung Dex Station function by connecting your smartphone and monitor via HDMI port in the hub.Converting your phone into a phone screen amplifier or PC like platform. Perfect for presentations,movie nights and more! Wide Compatibility Type c hub Compatible with MacBook Pro 2018/2017/2016, Macbook Air 2018,MacBook 2017/2016/2015,iMac, Samsung NoteBook/Galaxy, Huawei MateBook, Lenovo,Google ChromeBook and many other USB-C Devices. Superspeed Data Transmission & PD Charging USB 3.0 port provides Super Speed data transfer rate of 5 Gbps to any USB port. Backwards compatible to USB 2.0, USB 1.1 and USB 1.0. And this Extra durable usbc adapter with usb c charging port, you can use the PD port to charge your laptop and more type-c devices.It won't fall out and can save the trouble of inserting and unplugging. Ultra Portable Hub This Type C hub is built with ultra-slim and ultra-light size for you, this is so compact that easily fits to your macbook air case and travel bag, and allows you to expand your laptops' capabilities while on-the-go. It's convenient for your travel and work. 12 month warranty. If you have any issues, Please contact us first. Uniformly integrated in the metal build are 1 x Ethernet port, 1 x Type-C charging output, 1 x HDMI port, and 3 x USB 3.0 ports. While Wireless connectivity is the future, most users will argue that it is not yet on par with the stability of a wired internet access. 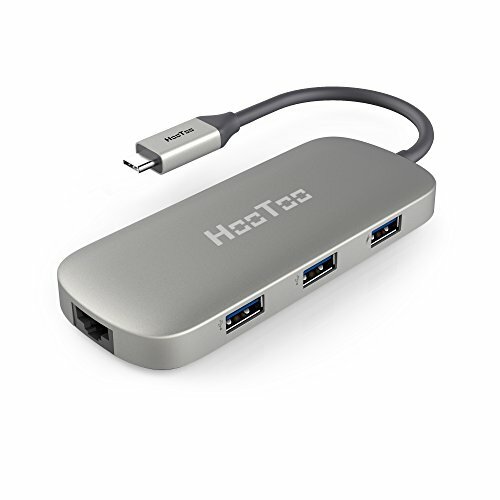 Implemented in the HooToo USB C Adapter is an Ethernet port so even your Type-C laptops without an Ethernet input can benefit from a more stable, wired internet connection up to 1 Gbps. With just one Type-C input to recharge, the latest MacBook Pro and USB-C powered Windows devices feel limited in terms of what they can do while powering up. The HooToo Hub features a Type-C input so you can charge your devices up to 100W even while multiple peripherals are connected and data is being transferred. Mirroring or extending a device's screen often suffers from image lag and synchronization delay. The in-unit HDMI port allows you to conveniently view crisp 4K UHD or Full HD 1080p videos on HDTV, secondary monitors, or projectors. If you are like most PC users, you rely on your device to get stuff done. 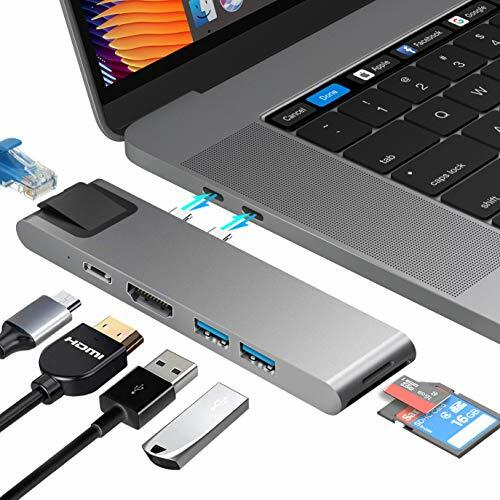 Featuring three additional USB 3.0 ports the HooToo Type-C Hub will equip your MacBook Pro or Type-C powered Windows laptop with a keyboard, mouse, flash drive, and other USB-A enabled peripherals. 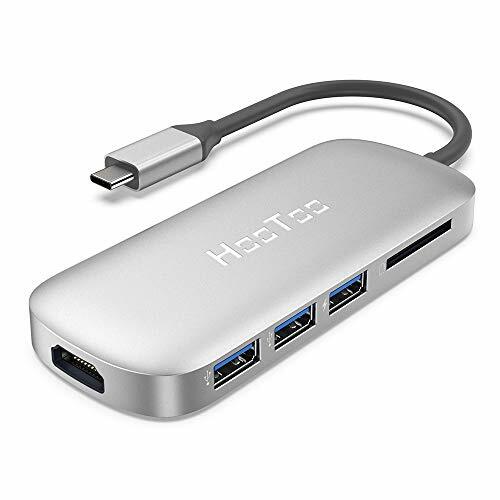 *HooToo USB C hubs do not support iPad Pro 2018. Stylish design with a distinctive look. 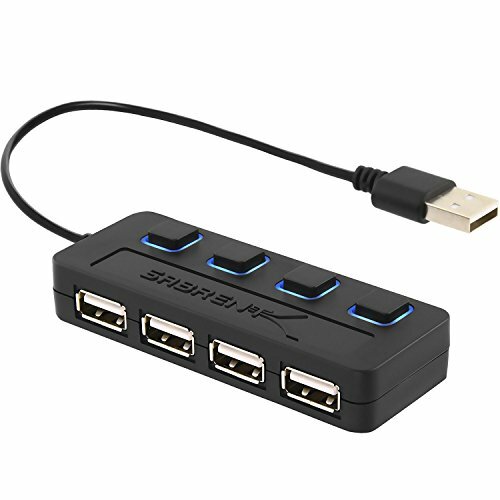 Add up to 4 devices with 4-Port USB 2.0 Hub. Each port has a power switch, allowing for individual port control. 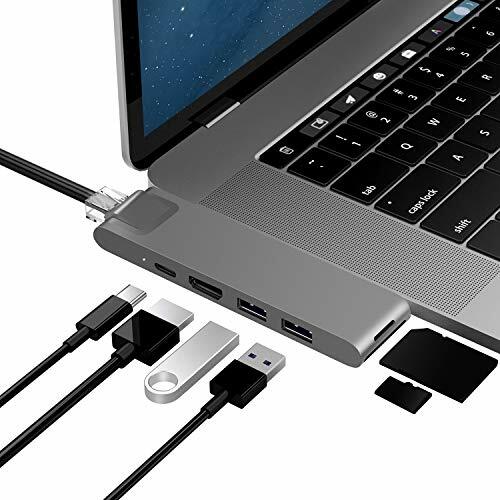 The Purgo Premium 7-in-2 Thunderbolt 3 Hub, Type C Adapter Dongle is the newest addition to our USB-C collection and the perfect companion for your 2018/2019 MacBook Air, 2016-2019 MacBook Pro. 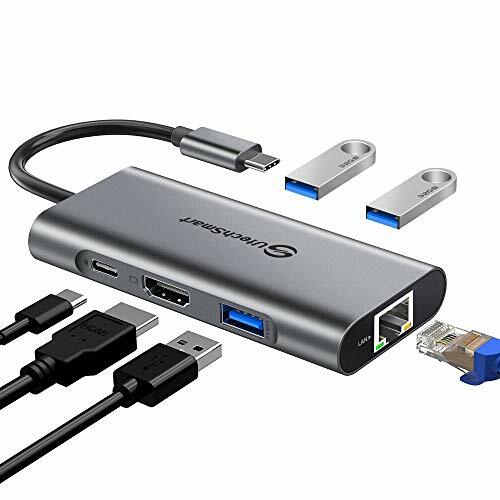 Sleek and slim, the USB C Hub features Gigabit Ethernet, 4K HDMI Video Output, a Thunderbolt 3 port, 2 USB 3.0 ports and SD/Micro SD card readers. Simply, plug and play to expand your MacBook's capabilities and enhance versatility. Specifically designed for 2019-2016 MacBook Pro and 2019/2018 MacBook Air. Versatile, Highly Portable, Plug and Play, Specifically Designed for 2019/2018/2017/2016 MacBook Pro and 2019/2018 MacBook Air. Massive Expansion - Featuring a total of seven ports that can all be used simultaneously - Gigabit Ethernet, 4K HDMI, 40Gbps Thunderbolt 3, 2 x USB 3.0, Micro SD and SD card readers. High-Speed Internet Connection - Access to reliable wired Internet connection speeds up to 1000Mbps. Also works on 10M/100Mbps networks. Strong Power Delivery - Support up to 100W power delivery to charge both 13 (61W) and 15 (87W) MacBook Pro at full speed while having all data ports in use and delivering up to 4.5W (5V/900mA) of power per USB 3.0 port. 2.Enjoy 4K Visual Feast HDMI port provides simple plug-and-play connection to a second display or monitor at resolution up to 4K@30Hz or full HD 1080p@60Hz ,Enjoy movies with your family on bigger screen or make a vivid presentation in a meeting. 3.Plug & Play Kameida USB Type C hub is ready to use immediately after plugging in the device. No additional drivers or applications are required. Easy extension of USB-C devices and fulfillment of your daily usage. 4.Type C On-The-Go This type c adapter supports OTG feature with OTG compatible phone / tablet to connect flash drives, mouse, keyboards or controllers and other USB peripherals. Type c hub must connect power delivery when using HDMI Function for Ninteodo Switch,Samsung S8/S8+/Note8,HUAWEI P20 pro. 12 Month Manufacture Warranty! Best Service for you . Type C On-The-Go This type c hub adapter supports OTG feature with OTG compatible phone / tablet to connect flash drives, mouse, keyboards or controllers and other USB peripherals. 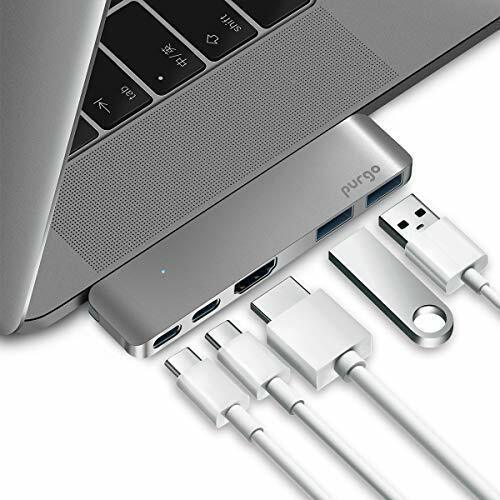 The Purgo Aluminum Thunderbolt 3 Hub, Type-C Adapter Dongle is the newest addition to our USB-C collection and the perfect companion for your MacBook Air 2018, MacBook Pro 2018/2017/2016. Sleek and slim, the USB-C Hub features 4K HDMI Video Output, a Thunderbolt 3 port, a USB-C port, 2 USB 3.1 ports and SD/Micro SD card readers. Simply, plug and play to expand your MacBook's capabilities. Specially designed for 2018 MacBook Air, 2018/2017/2016 MacBook Pro - compatible with 13" and 15" models. 4K HDMI Video Output: 1080p @ 60Hz up to 4K @ 30Hz It is convenient to extending a second display or mirroring your MacBook Pro to a projector. 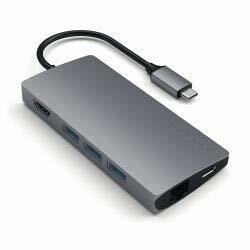 Thunderbolt 3 USB-C Port: Full function Type-C connector, up to 5K or 2x4K @ 60Hz video output, up to 40Gb/s data speed. Support MacBook Pro 61W/87W original Adapter. USB-C Port (Data Only): Standard USB-C 3.1 for superfast data transmission at 10Gb/s, Plug & Play. SD/Micro SD Card Readers Support SDHC, SDXC, Micro SD, Micro SDHC (UHS-I), Micro SDXC (UHS-I) card up to 104MB/S data speed, 2TB capacity. 2 USB 3.1 Ports (Gen 1) : Support USB 3.1 Gen1 5Gb/s data speed, compatible with USB 2.0/1.1, Plug & Play. Mac-Style Design: Designed with the same minimalist style and aluminum exterior as the MacBook Pro, its premium look matches its premium quality! Worry-free Guarantee: 18 months manufacturer warranty, professional and friendly customer service! Note: Not fit to MacBook Pro with Case/Cover. Does not support Apple USB Superdrive. Designed for 2018/2019 MacBook Air, 2019/2018-2016 MacBook Pro w/ Thunderbolt 3 port - including 13" and 15" MacBook Pro. Big Expansion - Featuring a total of seven ports that can all be used simultaneously - HDMI, Thunderbolt 3, USB-C Data Only , 2 x USB 3.1, Micro SD and SD card readers.